If you're looking for a high-value car and you like the Kia Spectra's more expressive styling, this is a lot of vehicle for not much money. And you might especially appreciate the sprightly demeanor of the SX version. The reliable and dependable of the 2009 Kia spectra. I have owned a 2009 Kia spectra for about 3 years and has been a very reliable car. I drive a lot from VA to SC to visit family and it still holds up really well. I am pleased to say it has been a very reliable car and has not needed any major repairs on it. I drive 2 kids around a lot and it is great for taking the kids to wherever. There's plenty of room for them to get in and out and plenty of room for their legs as well. It also holds all of their equipment. One of the kid uses a walker and it folds up nicely in the trunk of the car with room for a few other things as well. The only two things I wish it had was tinted windows and air vents in the back. It gets pretty hot in the south during the summer and not having both of those things makes it kind of miserable in the back for the kids. I have tried putting up shades in the back but it really does not help. It also does not help because there is no air flow to the back. I put a fan up and that helps some. The ideal first car- the Kia spectra. This is a great first car for a young driver. It is safe and handles well. In addition, the interior is spacy and does not feel as enclosed as other smaller cars. The gas mileage is fairly good, I have gotten around 350-400 miles on a tank. The hatchback is awesome, especially for someone like me who is often lugging around golf clubs, softball bags, my snowboard, or some combination of the three. I highly recommend this car to anyone who is looking for a smaller vehicle that can still hold most equipment. Kia spectra. Kia seem to make reliable cars I am my opinion and experience. I am the original owner of my Kia. I haven't had to many issue with it as far as now. Everything under the hood has not gave me too many issues. I have and problems with tail light issues and door handles breaking easily. It's been pretty reliable for me so far. I drive a lot and have 180, 000 miles already. The front seats are not comfortable for a small person so I bought a car back rear that help a lot. If I could afford it I would definitely buy an new car. It would for sure be another Kia. 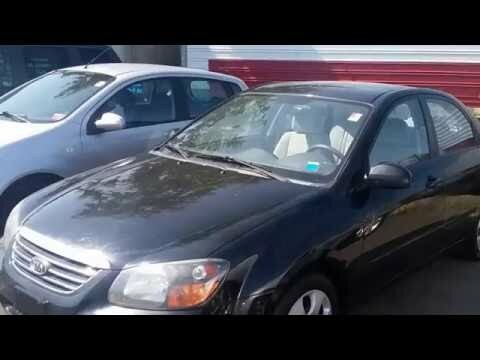 2009 Kia Spectra Walk Around and Review.